Virtualization Manager is already packed with great monitoring capabilities for the VMware (or Hyper-V) virtualized infrastructure. And while it does a very good job in near real-time monitoring of data center's availability and capacity management, it doesn't tell much about the vulnerability of the data center against potential incidents. Yes, we are talking about solutions that can proactively predict unavailability, performance issues and security vulnerabilities. When SolarWinds VMAN fires the "DataCenter down" alert, any good admin starts the troubleshooting process. As they troubleshoot, the main questions that need answering are "why did this happen?" and "how can we make sure it does not happen again?". And yet the answers take a tremendous amount of time because they require testing and validating on the rest of the environment. Both problems can be solved by integrating Runecast Analyzer and SolarWinds VMAN. Once integrated, the solution offers predictive issue detection together with detailed configuration, best practices, and security analysis. Admins are presented with easy ‘how-to’ guides to prevent all the issues. Let's have a look at the final result. At the screenshot below, we have VMAN loaded up with several vCenters, ESXi hosts and VMs and Runecast Analyzer resource on the summary page. Runecast shows "zombie" type of issues just waiting to strike your virtualized data center. You probably noticed that SolarWinds VMAN doesn't detect any problems for vCenters or ESXi hosts but Ruencast shows more than 70 issues including Purple Screen of Death issues (which may kill all of your VMs without any notice at the same time) on the 7th row. How to integrate Runecast with VMAN? The integration is short and simple. You may follow each step below and have functional integration in minutes. Add at least one vCenter to Runecast Analyzer and SolarWinds VMAN (via add node). 2. The token has been generated and because it won't be displayed in the list, save it to a notepad or another temporary place. 3. Switch to SolarWinds VMAN web console, go to main menu Virtualization -> summary. We will create a custom HTML resource. Click customize on the left-hand side to add the widget. 4. Once you are in page edit mode, click "Add Widget" and search for "custom HTML"
5. Click on "Custom HTML" and simply drag & drop it to the place on the page where you want it to appear. Then click "Done Editing" button on top of the page. 6. Now for the main thing. Add a custom-integration code to the new HTML resource. Click "Edit" on the Custom HTML resource which will take you to the edit mode. 8. 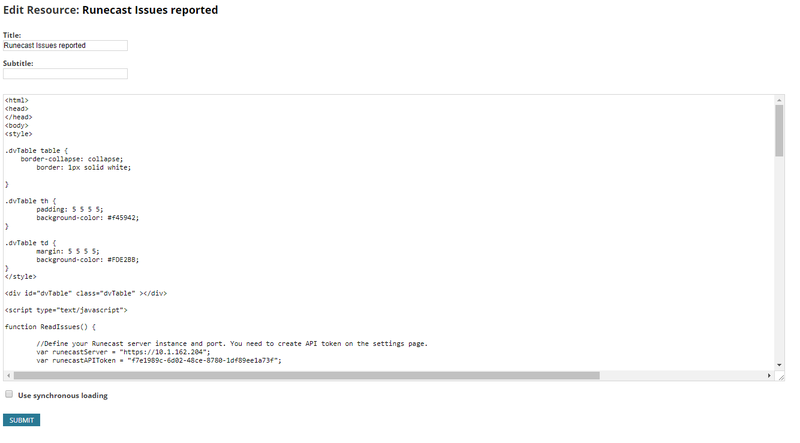 Copy and paste the source code into the last input field of the Custom HTML resource edit form (like pictured below). 9. Find "runecastServer" text in and replace the IP address with the IP address or hostname of your Ruencast Analyzer appliance. Then update the row below and replace the ID for runecastAPIToken with the token we generated in step #1. Hit "Submit" button once you're done. 10. That's all. You should now be able to see the result of proactive issue analysis by Runecast Analyzer together with "how-to-fix" links which can help you with troubleshooting of incidents reported by VMAN. 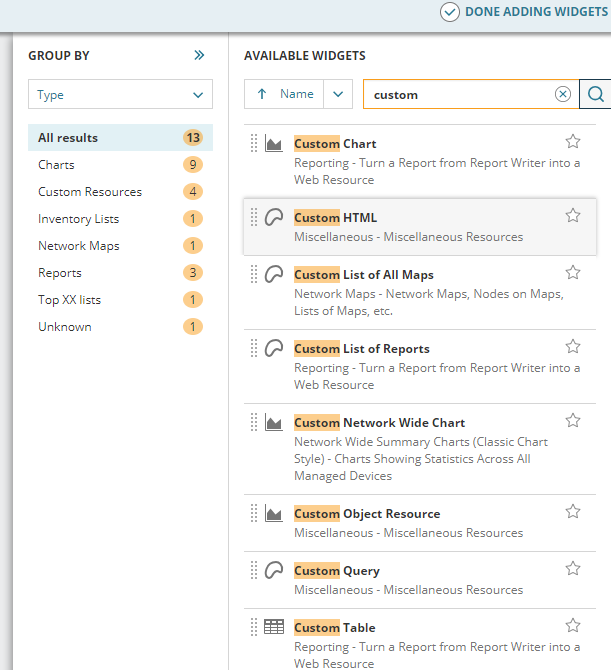 The integration is flexible and you can also add details about specific configuration values which were evaluated as problematic or you can pivot the table and see report per IP address. More about Ruencast API can be found here. If you don't want to bother with this customization, try Loop1 which can help you with any kind of SolarWinds customizations.